Natural story tellers are subject to a particular bias: They want their story to be concise and coherent. In service of a good yarn, they may make too much of a particular detail or overlook contradictory evidence. And if a story can go wrong on any single telling of it, how reliable can it be after being passed down through generations? I mentioned that I have been collaborating recently with Shirley Portnoy on sundry Rabbi Spektor genealogy matters. Today, she forwarded to me the report prepared for her in 2013 by Yuri Dorn, the Jewish genealogist from Minsk who had once guided my brother Walter on a roots tour to Rabbi Spektor's birth village. Yuri's research for Shirley proved her connection to the rabbi's lineage through the Yezersky family. It had been long known, as covered on this blog in 2008, that the young rabbinical scholar Yitzchak Elchanan Spektor had been married at age 13 into the family of Eliezer Yezersky, a merchant of Volkovisk in the Grodno province. Liezer's 14-year-old daughter Sora Reisel was the bride, but the whole Yezersky family benefitted by its association with the promising scholar. The family included two older twin brothers of Sora's and two other younger boys. The twins were Yudel-Movsha and Abram, born in 1800. Yuri found the vital records to show that Shirley's Harkavy family line descended from the daughter of Yudel Yezersky, Sara-Taibe Yezersky, who married into the Harkavy family. Sara-Taibe was the niece of Sora Reisel, though she was just six years younger. Shirley has family lore that the Kovno Rav visited the Harkavy family in Volkovisk and selected one of the Harkavy family to study in his Kovno yeshiva. This story seems to be borne out by the proven connection between the families. All this I knew already. What happened today is that Shirley sent Yuri's research papers including an extensive Yezersky family tree. His chart shows the family of Yudel's twin brother Abram Yezersky. He married Sora Leya and their four children included Berta, born in 1828. This Berta would have been a first cousin to Sara Taibe and a niece to Sora Reisel. The families lived together in the same household in those years. Two years after Berta's birth, the auspicious marriage between Sora Reisel and the future rabbi took place. Yitzhak Elchanan then lived with the Yezerskys for the next six years while finishing his studies under the eminent rabbi Benjamin Diskin. Is this Berta Yezersky the same person who appears as Bertha Yezersky Rabinowitz on my great-grandfather's death record? Her name, age and location fit the facts as we know them, and most importantly she provides a believable source for the family legend of a Rabinowitz relation to Rabbi Spektor. At this point, I believe that this Berta Yezersky is, indeed, my great-great grandmother, and that she did grow up in her early years together in the household with the future Gaon. I believe it, but I won't officially claim it to be true until more evidence comes in to confirm it. 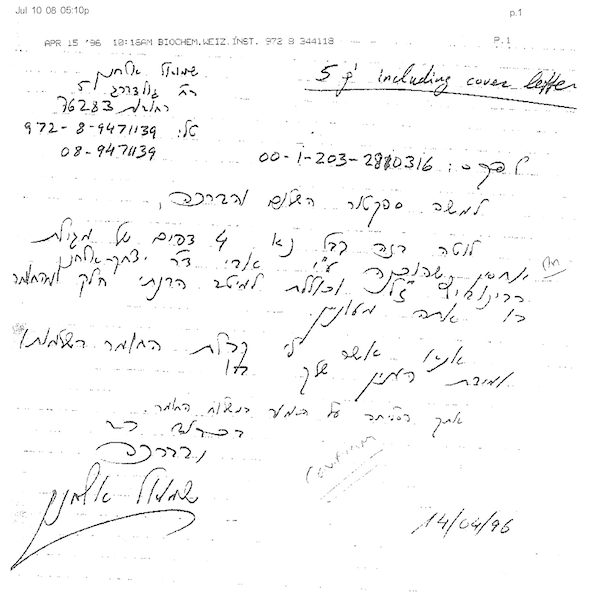 I wrote in the previous posts about pages 1 and 4 of the five-page fax from Shmuel Elchonan. What about the other pages? According to Shirley Portnoy, who was so good as to decipher the text, page 3 is substantially similar to page 4, but missing one section. As for pages 2 and 5, I will let Shirley describe them. Page 5 is the preface to the genealogy that Shmuel's [maternal] grandfather, R' Yehoshua Mordechai ben R' Moshe Avraham Rosenblum, z"l, compiled. The grandfather's name, place and date of birth and death are written at the bottom of the printed page, along with those of the grandmother (? ), Itta Marya (unclear), daughter of R' Avraham Shmuel Shlomo Horvitz. Both appear to have died in Tel Aviv. from Isaiah, 51:1, "Look to the rock from which you were hewn." from Proverbs, 17:6, " The crown of elders is grandchildren, and the glory of children is their parents." To summarize, he states that in the past there was little change from one generation to another, and families lived in the same countries, in the same towns, for decades and even centuries. In those times families handed down the stories of their families from parents to children, and even recorded them. In the present, he says, after the horrors of World War II, Jews were uprooted from their homes and dispersed far from their ancestral homes and from those people once familiar to them. Even those who were fortunate to come to Israel have been distanced from their familial origins. And so, he says, he has written this ancestral history for his children and grandchildren, based on what he has found in various writings and books (sefarim) and what he recalls from his own memory, so that the new generations will find glory in their family's past. Page 4 of the 1996 fax from Shmuel Elchonan contains the Spektor family genealogy as recorded by his father Yitzhak Rabinowitz. The translation by Shirley Portnoy follows. R’ Yitzchak Elchanan was born in the year 1817 (?) in the small town of Rus in the district of Grodno (in Russia). He was the son of R’ Yisrael Isser, (son of Elchanan) and his wife Rachel, the daughter of R’ Yitzchak. The surname of the brothers was Spektor. At the age of 13, R’ Yitzchak Elchanan married Soro Reizel, the daughter of R’ Eliezer Yezerski and Bluma in the city Volkovisk (in the district of Grodno). R’ Tzvi Hirsh, born in 1847, took over the rabbinic position in Kovno after his father’s death. He died in 1910. R’ Binyamin, born in 1852, was murdered in Kovno at his home in 1900. The Rabbanit Soro Reizel died in 1882. The surname of all the sons of R’ Yitzchak Elchanan was Rabinowitz. In the year 1883 R’ Yitzchak Elchanan married Chana Davidson (Meizlsz). R’ Yitzchak Elchana died in Kovno on the 21st day of Adar 1896. R’ Binyamin was born in Navahradak on the 27th of Elul 1852. In 1870 he married Devora, the daughter of R’ Eliyahu Behr. Dvora was born in (?) in the year 1851, and she died in Kovno the 20th of Iyar, 1929. Meshulam Fishel, born 1871, died in Kovno on Hoshanah Rabbah in 1940. Yisrael Isser, born 28th of Iyar 1873, died 28th of Iyar 1933 in Kovno. Daughter Yettel, born 1875, married Yaakov Kahanov from Lovni (Ukraine). She died in Kharkov. Daughter Bluma, born 1881, married Louie Solomonson from Riga. Yisrael Isser Rabinowitz married Fruma Frankel on the 1st of Nissan 1899. Fruma was the daughter of R’ Shimon and his wife Esther (Preiss). She was born on the 15th of Elul 1879 and was killed by the Germans at the beginning of 1944 in the Stutthoff Concentration Camp. Yitzchak Elchanan, born in Kovno on on the 27th (unclear) of Shvat, January 1900. Shlomo, born the 16th of Kislev, 1901. Daughter Miriam, called Mira, was born in 1904 and died in Stutthoff in 1945. Her child Isser, age -?, was killed in the Aktion against the children in the Kovno ghetto in 1943. Daughter Bella, born 1909, was killed together with her son Daniel in Stutthoff. Her husband, Zelig Volotzky, was killed in Kovno in 1941. May G-d avenge the blood of all our family and of all the children of Israel who were murdered at the hands of the wicked Germans. Back in 2008, I wrote extensively on this blog about the family history of the famous Kovno Rav, Rabbi Yitzhak Elchanan Spektor. In the course of that work, another Spektor researcher named Morris Spector sent me a copy of a fax he had received 12 years earlier, in 1996, from Shmuel Elchanon, a descendant of the rabbi born in Kovno in 1930 and still living today in Rehovot, Israel. By coincidence, my brother Walter in the course of his journalistic work had also met Shmuel, and thus I had the chance to participate in a conference call with him to learn more about his amazing family history. I won't review it here now (search the site for Shmuel and Spektor to find the old posts), except to remind you that his family descends from Spektor's fourth son Benjamin Rabinowitz (all the Spektor children took the Rabinowitz surname). 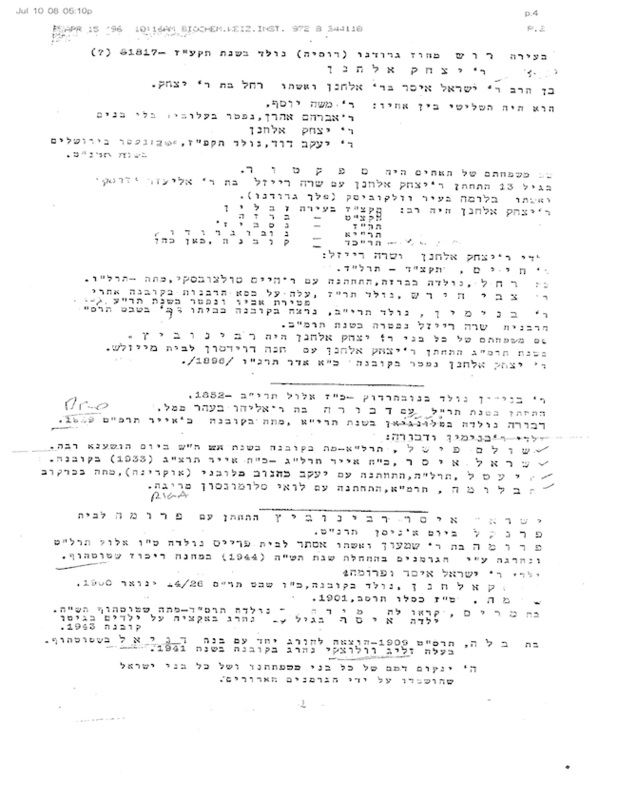 The fax I received from Morris was four pages in Hebrew print with this cover note of handwritten Hebrew. I planned to have the pages translated at that time but I never got around to it. The untranslated fax languished for years in an unopened file of papers. Last week, another Jewish genealogist I had encountered several times before, Shirley Portnoy, contacted me about some of the Spektor information I had posted on Geni, the genealogy website, in 2008. Shirley is active on Geni and she wanted to clean up some of the inconsistent information about the Spektor family that had been posted through the years. It seems that back then I had been as guilty as others of posting speculative information (I'm more careful now). After reviewing the history, I agreed with her that two of the profiles I "managed" at Geni should be removed. Then Shirley asked me about the fax from Shmuel that I had blogged about. I was able to find the pages in my files and scanned them to make a digital file. Since the source was a photocopy of an original fax, the image quality was not good. I sent the scans to Shirley with a question, "How's your Hebrew?" The answer to that turned out to be "tov meod" (very good). Within a few hours she translated the cover page and provided a summary of the contents. Overnight, her full translation of the crucial Page 4 of the fax arrived in my mailbox. She cautions that some words are fuzzy and others cut off on the right margin, so the translation is her best approximation. I'd say it is fantasic. The image and translation follow in the next post. Todah rabah, Shirley. It has been some years since I originally reported on this blog that my grandfather Walter Ruby may have been involved in an illegal liquor conspiracy during the early years of Prohibition. He was one of six individuals indicted in April 1922 in what came to be known as the Catrow conspiracy. The criminal case was later dismissed. You can see our previous coverage here, here and here. Now that I have been recently focused on my grandfather's life in the years just prior to the dates in the indictment, I wanted to go back and see how his involvement in this matter aligns with our other known facts in his personal life and professional resume. Unraveling all of that will require several posts. For starters, let's see if we can find a plausible connection between our Walter Ruby and any of the other named individuals and entities in the indictment. This morning I made a quick scan for historical information about the five individuals and two business named in the indictment. Herbert G. Catrow - Prominent businessman who as assistant Prohibition director in New York authorized liquor withdrawals. Hill & Hill Distilling Co. - Kentucky distillery owned by bootlegger George Remus from whose New York City warehouses the withdrawals were made. 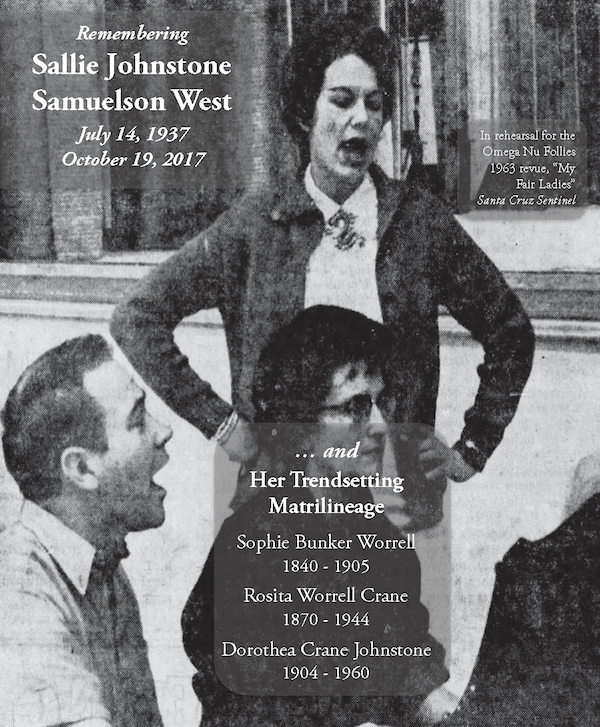 On this day of a memorial celebration in Santa Cruz, Calif., of the life of Sallie Johnstone Samuelson West, here is a tribute to her musical inspiration and her matriarchal lineage, which I recently researched for a genealogy project. The photo is from a community theater rehearsal in Santa Cruz in 1964. I did not personally know Sallie or her foremothers, but I admire the lives they lived. Here's to the future generations! 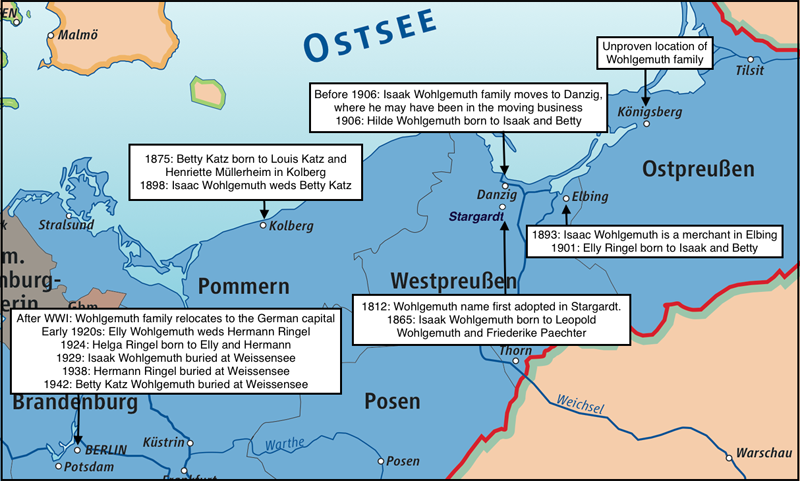 Why did the Wohlgemuths leave Danzig? In all our writings so far, it has been said that the Wohlgemuth family relocated to Berlin from Danzig during or more likely after the First World War in order to find better prospects for their marriageable daughters Elly and Hilde. That's a nice story and no doubt partly true, but there were very likely other factors motivating the family's move. Danzig was a cosmopolitan German city in Isaak Wohlgemuth's day. The city's considerable Jewish community tended toward assimilation with the German state. The leading synagogues and community leaders were liberal. Zionism took hold slowly and was rejected by most Danzig Jews in the early years. Also, eastern Jews from Russia were discouraged both by German law and the attitudes of German Jews from settling in Danzig. 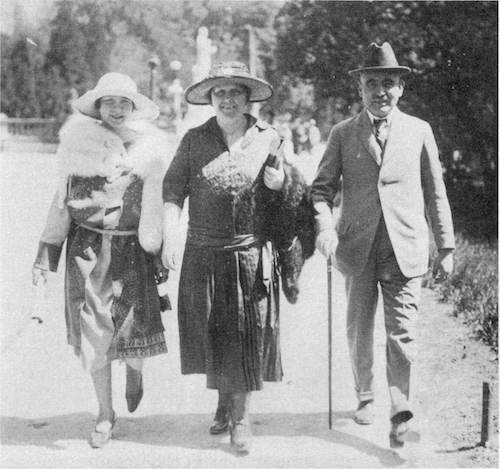 The photo is not of the Wohlgemuths but of prominent Danzig businessman Franz Boss and his family, out for a Sunday stroll in pre-WWI Danzig. In 1920, under the terms of the Treaty of Versailles, Danzig became a semi-autonomous city-state called the Free City of Danzig, created as a buffer between the reduced German republic and a new Polish nation. The city became a free trading zone and a point of embarkation for transit to the west. Tens of thousands of Polish and Russian Jews passed through the city on the way to England and America, and Danzig's own Jewish community swelled with the addition of eastern, orthodox, Zionist Jews who could now freely settle in the city. It must have come as a unwelcome change for long-time Jewish residents of Danzig. Our grandmother Elly grew up as a Jewish Danziger, perhaps until age 19 or 20. Possibly we can see here the formation of some of the attitudes she later projected: her disdain for östjuden and her disinterest in Zionism. Perhaps we also see here the real reason that Isaak Wohleguth pulled up stakes from the rapidly changing Danzig to a place, Berlin, where a more civilized and cosmopolitan Jewish lifestyle was practiced. If so, that explains why the Wohlgemuths chose to permanently leave their native city at the very time Danzig's Jewish population was dramatically on the rise. A German-American Jewish historian, Gerhard Salinger, who is the author of detailed studies of the Jewish communities of Pomerania and West Prussia, has collected the available Jewish records for the town where our Wohlgemuth family originated. We learn this from a December 2010 review of Salinger's West Prussia book by Dorothea Shefer-Vanson in the Journal of the Assoiation of Jewish Refugees, in which she describes Salinger's methods using his work in Stargard as an example. Here is the relevant passage from the review. So how has he set about his seemingly overwhelming task? Take the town of Preussisch Stargard (now Starogard Gdanskie) as an example (see Part I). What can the reader expect to find here? Apart from a brief potted history, Salinger notes that two Jews, Mendel Salomon and Alex Baruch, were permitted to settle there in 1774 because they possessed more than 1,000 Taler. By 1812 there were 112 Jewish households, and individual names - both original and adopted later - are listed. The population had grown to 597 by 1840, to 688 by 1849, and to its highest number (802, 13.7 per cent of the population) by 1870. There was a synagogue, a rabbi and a school. Salinger goes on to list all those Jews who paid taxes in 1883, stating their names, occupations and places of residence. There is also a list of tax-payers in 1911. The names of two men who lost their lives in action during the First World War are given, as are extracts from the Secret State Archives in Berlin concerning the election of Jewish officials and other matters. There is a list of deaths, giving names and age, going back to 1848, and a long list of deaths from 1857 until the community ceased to exist. It is striking that many died at a relatively young age. There is no information on where and how they died, but it is nonetheless an extraordinarily detailed survey. On his visit to the town, Salinger discovered that the synagogue is now used as a shopping centre and that the greatly neglected cemetery has a number of gravestones, many severely damaged but five still standing upright, with the names of Mendelsohn and Wohlgemuth recognisable. Photographs of the former synagogue and the cemetery are provided. How wonderful that he has called out the recognizable Wohlgemuth headstone that we have already discovered among the resources at Virtual Shtetl. More importantly are the multiple lists of residents, taxpayers, deaths, and war casualties for various years between 1812 and 1918. Undoubtedly we wiill be able to find more about our Wohlgemuth ancestors in Stargard by examining the actual book. It is written in German in three volumes and evidently there are very few copies in existence. I will be trying to track it down. I annotated this map of the northeastern section of the German Empire under Kaiser Wilhelm II between the years 1871 and 1918 with what we have learned about the Wohlgemuth family movements during that time period. The map shows the provincial borders between East and West Prussia and neighboring Pomerania. I was wrong earlier when I said that Elbing was in East Prussia; it was within the boundaries of West Prussia. Also, Kolberg was in Pomerania, not West Prussia.